CN: The story of Merckx’s World Hour Record and the special bike you built is so interesting, even 32 years later. How did it all come about? EC: Even today, it’s hard to imagine how much work we put into building those two bicycles… in those days, the tubing was 6/10 to 4/10 wall thickness. A guy like Merckx, who weighed 72kg., 1m85cm high with incredible power, well, to build a superlight bicycle for someone like that took a lot of courage. I lightened everything; the cranks, drilled out the chain, because we wanted the lightest material and well, you couldn’t buy a Regina Extra chain with holes drilled in it! So the bike ended up weighing just over 5.5kg. Do you realize that the tubular tires we used, the Clement number 1 Pista, weighed 90 gr. for the front and 110 gr. for the rear! No one else could have put this bike together. For example, no one in Italy could weld titanium, so I went to Pino Morroni in Detroit, America to weld the special lightweight titanium stem for Merckx’s Hour Record bicycle. CN: When did you first hear of Merckx’s idea to go for this record? It wasn’t just something that came up the week before. EC: No, I think it was at the Giro that year that I first heard about it… and you know what I think? If the record had always used a regular bike like Merckx used, it would still be his. After Merckx came disc wheels and aerodynamic positions… if Merckx had used the same bike as Rominger had used when he set his World Hour Record of 55.291 km, he probably could have done 56 or 57 km in one hour. I’m sure of it. CN: So what was your initial technical approach to building Merckx’s bike? EC: First thing was a meeting with Merckx, Abani (Molteni d.s. ), Guido Costa (noted Italian track coach) and me. But it wasn’t that satisfying for me, because Costa talked mostly about techniques for pursuit races of 4 or 5 kilometres. But the challenge wasn’t to build a bike for those kind of races, but to build a timetrial bike as light as possible. For once Merckx made his start, there wouldn’t be any other jumps or violent efforts. He had to get up to speed and maintain it. So we figured out that Merckx would need 3 laps of the track to get up to his speed of 50km/hr. Once he hit that speed, the bike wouldn’t have much more stress on it. But as light as it was, when Eddy started and went into the first bend on the track, I was so nervous. He had so much power, with a drilled chain, super-light wheels… we just hoped that nothing would break. Merckx’s Hour Record bicycle was made as an extreme case. I’d never made a bicycle like that before and I felt like I was going to pass out when Merckx was out of the saddle the first few laps. Finally when he sat down, I could relax a bit. CN: Did you make any test bikes before the World Hour Record for Merckx? EC: Of course! We made two road bikes with the same geometry for him. When Eddy rode some races before going to Mexico, like the Giro del Veneto, he would go away solo and ride like that for an hour. He ended up winning some races with solo breaks then (Veneto, Lombardia) So in that phase, Merckx would give me more specific input about how the final bike could be improved. 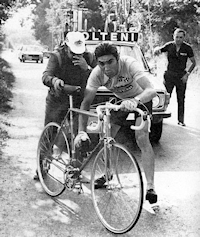 The only thing we couldn’t get for Merckx was Helium gas for the tires… but I couldn’t get it so we used air. We brought two bikes, 5 pairs of special 28X32 spoke wheels, extra Clement tubulars, extra saddles, an entire footlocker of Campagnolo material, including a special 122 gram headset, several extra Regina Extra track chains with drilled out links, Cinelli handlebars with 48 holes drilled in them and two extra forks. CN: Going back to the day of Merckx’s World Hour Record, October 25th 1972, what was the atmosphere like that day… you had Luigi Casola to help you out. EC: Yes, Luigi Casola was a former pro cyclist from the days of Coppi and Magni who had moved to Mexico and married a Mexican woman. He was kind of the manager of the Mexico City velodrome and helped us prepare everything there for Merckx’s record attempt. When we arrived the first morning, the UCI commisaires weren’t there yet. Then there was a little rainstorm… Merckx was nervous and so was everybody. So we went back to the hotel where Eddy rode the rollers and waited to the next day. It rained so we had to wait a few days. On the 25th, Merckx woke up and it was sunny. He had breakfast at 5:30 am and was already at the Velodrome at 6:45am. When we saw there was sun and no wind, we knew it was time for the record attempt. There were a lot of people there and it turned out to be a spectacular day. CN: What did you expect would happen that day of Merckx’s record? EC: We thought he could ride almost 50 kilometres in one hour; that was what his schedule was planned for. We know knew he had the legs to do it and the head; it was a question about how long Merckx could hold out… but it was so hard! Merckx suffered terribly for the entire hour. It was a terrible match for Merckx. I remember during Rominger’s hour record, Merckx was there as well as other champions like Altig, Janssens, Sercu and everyone said Merckx could have gone further than Rominger, if he had the same type of bicycle, even if Rominger was the first rider do more than 55 kilometres in one hour. CN: I’ve seen the photos of you and Merckx after he finished his hour record… he looks destroyed; what did he say to you after he finished? EC: Eddy leaned on my shoulder and said ‘basta (enough)… that’s the last time I’ll ever do the hour record. The pain was incredible… ‘ But then he felt better and shook my hand and said ‘thank you’ and that meant everything to me. As I understood it, Merckx never suffered more than during that hour. He couldn’t get out of the saddle or slow his pedalling under 100 revs a minute. And then there was the bell… the real agony came from the bell. 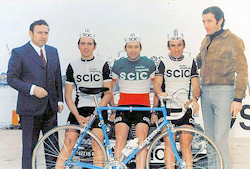 EC: Merckx’s schedule was put together by a Belgian journalist, Jacobs and Albani. So for every lap of the 148 laps Merckx rode, there was a bell that rang every lap according to his time schedule. Ring! So if he was ahead of the schedule, he would pass the finish line ahead of the bell, but if he fell behind, the bell would ring before Merckx crossed the line. So besides the physical pain, there was a lot of psychological pressure on Merckx as well during this attempt. CN: What did you do during Merckx’s attempt? EC: I was in the middle of the track with the spare bike on my shoulder in case there was a problem. So after a half-hour, I realized that it was likely that nothing would happen. The tires picked up rubber from the track and the tread became harder and wouldn’t puncture. We had cleaned the entire track with sponges that morning before Merckx rode, so I put the bike down and went over next to Albani. We cheered him on then; ‘ale Eddy, ale’. After about fifty minutes, Merckx got kind of dark in his face and looked like he was having a ‘crisi’, so Albani yelled ‘Eddy, go easy… ” and we heard him say ‘faticato’ (tired). We yelled ‘go easy for a lap’ and he recovered. It was Merckx after all. So he kept going and set this incredible record. Afterwards we had an unforgettable party to celebrate Eddy’s World Hour Record.